Während der letzten 15 Jahre sollen sich die Weltmeere nur verlangsamt erwärmt haben. Manche sprachen sogar von einer Pause. Doch das wurde erneut widerlegt. 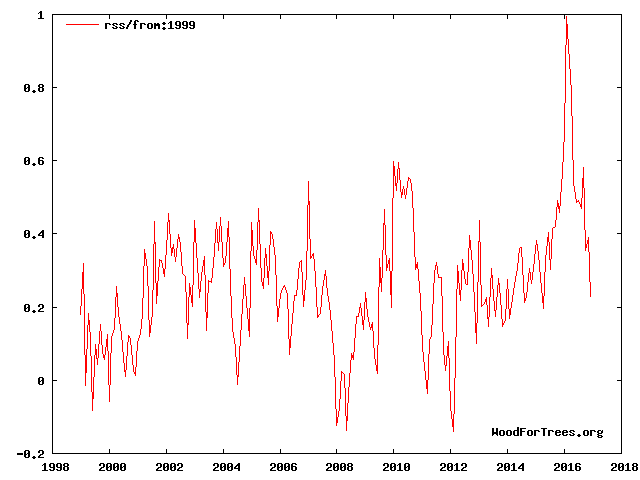 Abbildung 1: Ozeantemperaturen seit 1999 laut Hausfather et al. 2017. 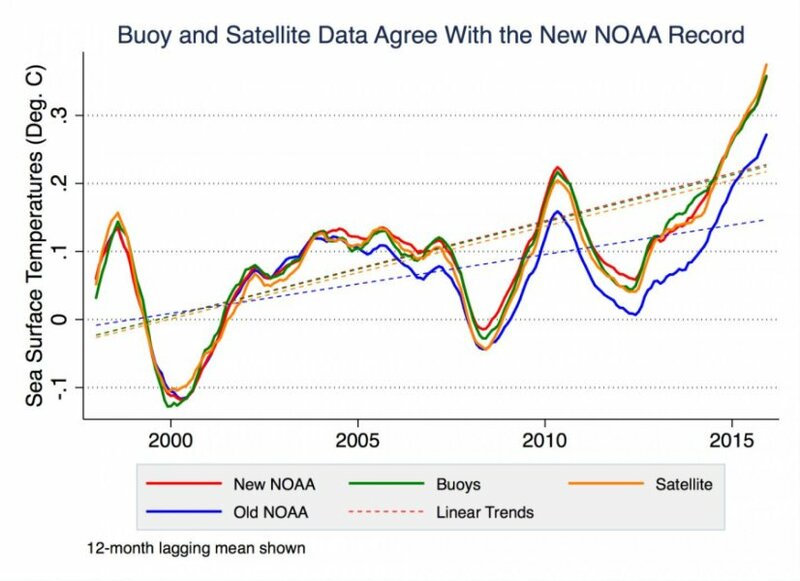 Originalbildunterschrift: “A new UC Berkeley analysis of ocean buoy (green) and satellite data (orange) show that ocean temperatures have increased steadily since 1999, as NOAA concluded in 2015 (red) after adjusting for a cold bias in buoy temperature measurements. NOAA’s earlier assessment (blue) underestimated sea surface temperature changes, falsely suggesting a hiatus in global warming. The lines show the general upward trend in ocean temperatures. Credit: Zeke Hausfather, UC Berkeley”. Abbildung 2: Globale Temperaturentwicklung seit 1999 auf Basis von Satellitendaten (RSS). Abbildung 3: Globale Temperaturentwicklung seit 1998 auf Basis von Satellitendaten (RSS). Trend in grün. 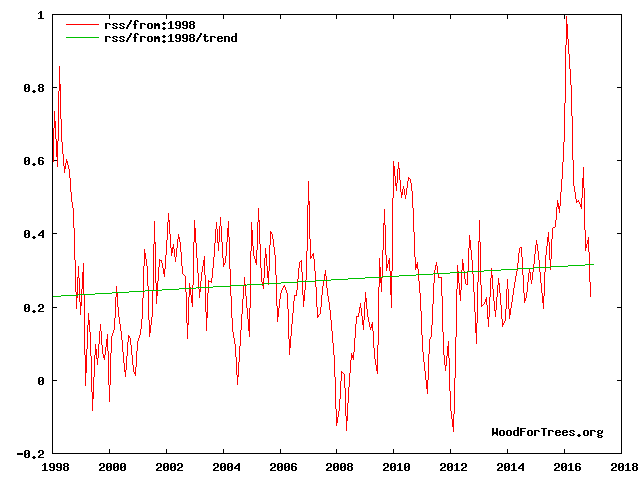 Abbildung 4: Globale Temperaturentwicklung 1999-2015 auf Basis von Satellitendaten (RSS). Trend in grün. Wieder ist die Erwärmung minimal, vielleicht ein zwanzigstel Grad. Da beißt die Maus keinen Faden ab: Der Slowdown ist real und muss ernst genommen werden. Eine Vielzahl von Forschern tut dies bereits und schreibt eifrig Papers zum Thema. Kühlende Ozeanzyklen sind vermutlich die Ursache der ausgebremsten Erwärmung. A new study of the temporary slowdown in the global average surface temperature warming trend observed between 1998 and 2013 concludes the phenomenon represented a redistribution of energy within the Earth system, with Earth’s ocean absorbing the extra heat. The phenomenon was referred to by some as the “global warming hiatus.” Global average surface temperature, measured by satellites and direct observations, is considered a key indicator of climate change. In a study published today in Earth’s Future, a journal of the American Geophysical Union, lead author Xiao-Hai Yan of the University of Delaware, Newark, along with scientists from NASA’s Jet Propulsion Laboratory, Pasadena, California, and several other institutions discuss new understanding of the phenomenon. The paper grew out of a special U.S. Climate Variability and Predictability Program (CLIVAR) panel session at the 2015 American Geophysical Union Fall Meeting. “The hiatus period gives scientists an opportunity to understand uncertainties in how climate systems are measured, as well as to fill in the gap in what scientists know,” Yan said. Natural variability plays a large role in the rate of global mean surface warming on decadal time scales. Improved understanding of how the ocean distributes and redistributes heat will help the scientific community better monitor Earth’s energy budget. Earth’s energy budget is a complex calculation of how much energy enters our climate system from the sun and what happens to it: how much is stored by the land, ocean or atmosphere. “To better monitor Earth’s energy budget and its consequences, the ocean is most important to consider because the amount of heat it can store is extremely large when compared to the land or atmospheric capacity,” said Yan. In the near term, the researchers hope this paper will lay the foundation for future research in the global change field. To begin, they suggest the climate community replace the term “global warming hiatus” with “global surface warming slowdown” to eliminate confusion. 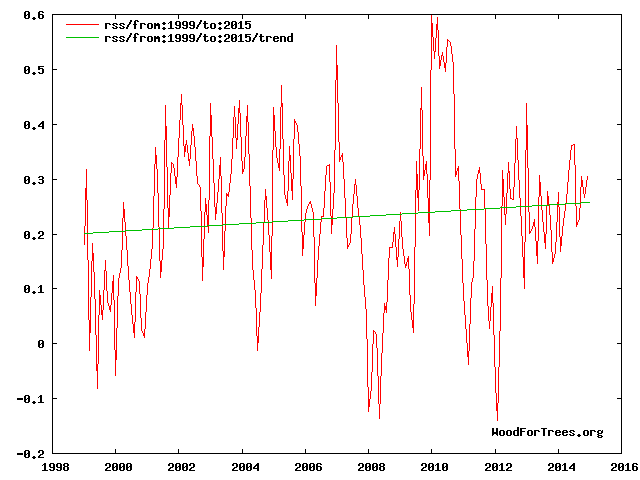 “This terminology more accurately describes the slowdown in global mean surface temperature rise in the late 20th century,” Yan said. The scientists also called for continued support of current and future technologies for ocean monitoring to reduce observation errors in sea surface temperature and ocean heat content. This includes maintaining Argo, the main system for monitoring ocean heat content, and the development of Deep Argo to monitor the lower half of the ocean; the use of ship-based subsurface ocean temperature monitoring programs; advancements in robotic technologies such as autonomous underwater vehicles to monitor waters adjacent to land (like islands or coastal regions); and further development of real- or near-real-time deep ocean remote sensing methods. Yan’s research group reported in a 2015 paper that some coastal oceans (e.g., U.S. East Coast, China Coast) responded faster to the recent global surface warming rate change than the global ocean. “Although these regions represent only a fraction of the ocean volume, the changing rate of ocean heat content is faster here, and real-time data and more research are needed to quantify and understand what is happening,” Yan said. Variability and heat sequestration over specific regions (e.g., Pacific, Atlantic, Indian, Southern Oceans, etc.) require further investigation, the authors conclude. However, there is broad agreement among the scientists and in the literature that the slowdown in the global mean surface temperature increase from 1998 to 2013 was due to increased uptake of heat energy by the global ocean.